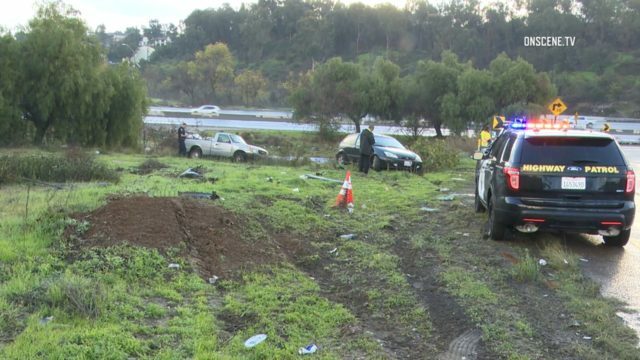 A California Highway Patrol officer who was investigating a freeway crash Sunday morning in San Diego was struck by a vehicle whose driver lost control due to wet road conditions, according to a CHP sergeant at the scene. The officer, who officials did not identify, was “standing by on the left shoulder” of westbound SR-94 transition to the southbound I-15 investigating an abandoned crashed truck around 6:45 a.m. when the driver of a black Ford Focus lost control and struck the patrol car, according to CHP Sgt. Joseph Aboy. The officer complained of only minor injuries; the Ford driver was apparently uninjured, Aboy continued.